BioNumerics offers a generalized and well-documented implementation of ANOVA (Analysis of Variance) and MANOVA (Multivariate Analysis of Variance) with comprehensive statistical analysis and validation testing tools. These very useful statistical methods allow you to investigate the relation between groups of entries and characters, as well as the significance of such groups. The groups can be clusters derived from a dendrogram, or any user-defined selections of entries (e.g., by origin, species, serotype …). Every plot, table or report is a hyperlink that can be viewed in detail or exported as text and HTML. To facilitate the interpretation of the various assumption tests for non-experts, the result of each test is indicated as a circle that ranges from green (OK) to red (assumption not fulfilled). Comprehensive exploratory data analysis reports including group means, histograms, and covariance matrices. 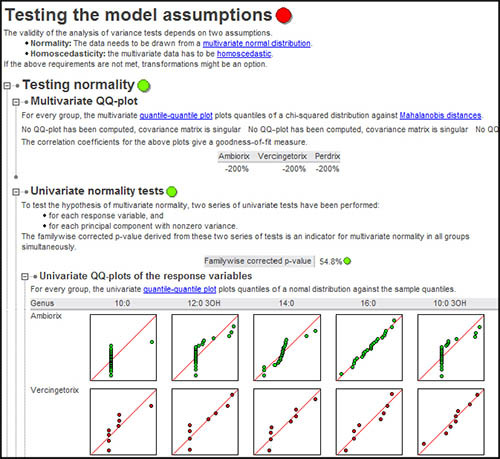 Full validity testing of the model including multivariate normality test, univariate normality tests (QQ plots and Kolmogorov-Smirnov tests of response variables, QQ plots and Kolmogorov-Smirnov tests of principal components), and homoscedasticity tests. Possibility to select useful characters directly from the Analysis of Variance report window and mark these characters as active/inactive for analysis and identification purposes. Canonical discriminants analysis for in-depth assessment of the discriminatory importance and behavior with respect to explanatory variables of each character.